The Sultaness is a US-based company that provides a variety of handmade accessories including hijab pins and rings. I was recently sent the Bijoux pin; Razzle-Dazzle pin; Flower Pot Crimson pin and Bow Ring; to review. 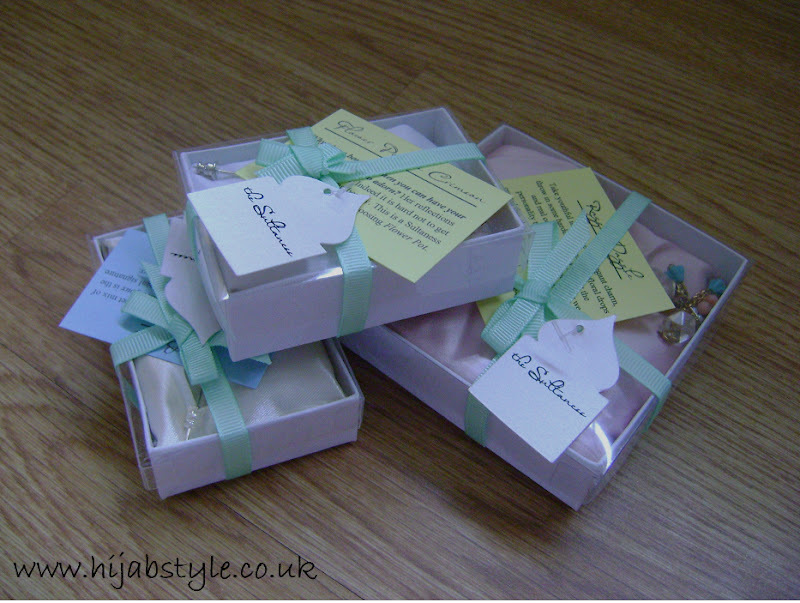 The accessories come beautifully packaged in gift boxes and ribbon; making them perfect to give as gifts. The pins also come with a cleaning cloth included. The pins measure approximately 7.5cm long, and are secured with a removable bell back at the end. As they are quite large and heavy, they're only really suitable for use on thicker scarves. The Bow Ring is a simple pink and brown striped fabric bow, with an adjustable band (it's also available in other colours). It's a fun, cute piece that can easily be worn with casual outfits. Overall I found the Sultaness accessories to be quite unusual; I liked the combination of colours used, though felt the stick pins were quite big and difficult to use without making large holes in delicate fabrics. You can check out their products over on The Sultaness website.